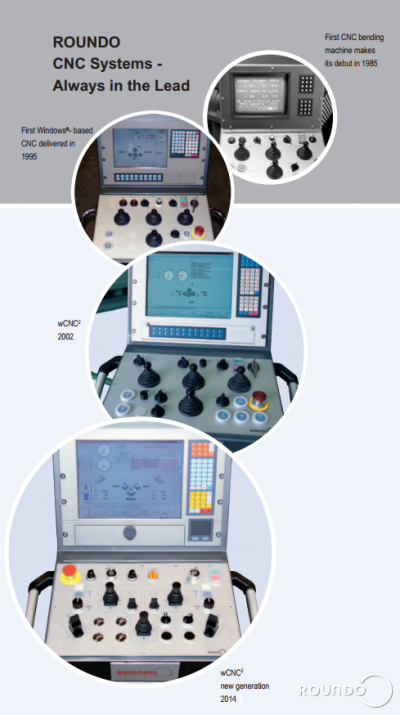 Did you know that in 1985, Roundo was the first to develop CNC controls specifically adapted to bending machines. We have ever since steadily improved and expanded the capabilities of our systems which has allowed us to maintain our position as the world leader in this area as well. The ROUNDO wCNC² control is a PC-based CNC control running under Windows 7. This highly advanced and powerful system can control up to 24 axes, including the main bending rolls and any type of optional equipment. The system is available for all models, it is easy to operate and do not require any previous CNC-experience. The operator can choose from a large number of languages for the CNC control. The ROUNDO wCNC² software is written in-house in Sweden by our Roundo engineers who understand the complexity of both bending and machine control. No other competitive machine offers the combination of true PC-based CNC control using only the highest quality digital components and software designed by experts in the field. That is what makes ROUNDO the world leader in bending machines.